Another glass ceiling is shattering at Babson College. Marla Capozzi (above right), who received her MBA from the Wellesley school, is set to become the first woman to chair Babson’s board of trustees this fall. Capozzi currently serves as vice chair, and her appointment comes four years after Kerry Healey (above left) broke another barrier by becoming Babson’s first female president. 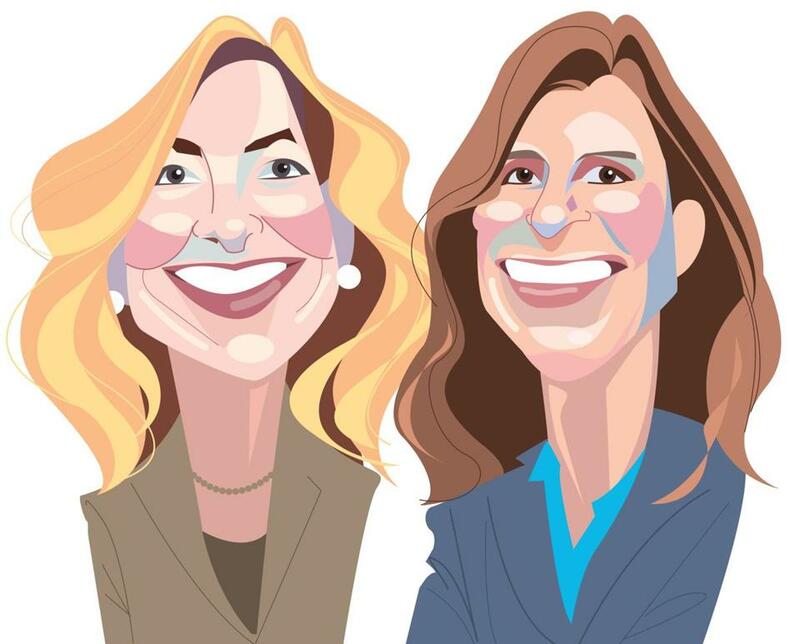 With Capozzi and Healey, Babson is believed to be the only Massachusetts business school with two women at the helm. Babson, founded in 1919 as a business school for men, is known for its entrepreneurial education. In recent years, the school has also distinguished itself with its Center for Women’s Entrepreneurial Leadership, as well as with research on female entrepreneurs through the Diana Project. It also launched a venture accelerator for women. With so much attention on women, perhaps it should come as no surprise that female students will make up 54 percent of the centennial class of 2019, the first time women outnumber men. Babson has about 2,100 undergraduates. Capozzi succeeds Joseph Winn, who is stepping down as chair in October after six years in that role. Even the apolitical have an opinion these days. Take former general David H. Petraeus, who does not vote and called himself “quite passionately apolitical” in an interview following a talk on Monday at the Boston Convention & Exhibition Center. Standing among his new industry colleagues at the Global Business Travel Association Convention, the retired officer turned CIA director turned subject of legal scrutiny turned global investment firm chairman discussed the current White House — in vague terms. “By and large the policy-making process is developing reasonably well,” Petraeus said during his speech, pointing out that this is not the work of the White House alone, but involved other government branches. And President Trump’s meeting with Israel’s prime minister, Benjamin Netanyahu? “Yes there was a little bit of a fumble there,” he said, referring to Trump’s claim in front of reporters that he could “live with” whichever solution to the Middle East’s problems that they’d like. But not to worry, “the next day, it was clarified by ambassador Nikki Haley,” Petraeus said, referring to ambassador to the United Nations, who reaffirmed that, yes, the United States really would prefer a two-state solution. How about Rex Tillerson, the former ExxonMobil chief executive who beat out Petraeus for secretary of state? The general praised the energy mogul’s hesitance for the spotlight. “He’s one of those rare individuals, you can stand between him and a microphone and not have your life at any risk,” Petraeus said. Six months after two longtime partners left Larry Rasky’s public affairs firm, he is bringing on two big-name reinforcements. Bob Sherman, founding member of the law firm Greenberg Traurig’s Boston office, and Ron Walker, the state’s former secretary of labor, are taking on substantial consulting roles with Rasky Partners, joining Rasky’s team as senior advisers. Sherman returns to Boston from Portugal, where he was US ambassador for roughly three years. He has been a shareholder at Miami-based Greenberg Traurig since 1999. Sherman will be assisting with Rasky’s growing international relations practice, among other responsibilities. Walker had been secretary of labor in Governor Charlie Baker’s administration until July 1. (Rosalin Acosta took over Walker’s state position.) Walker will primarily help with expanding Rasky’s client portfolio in financial services and workforce development. Walker is a cofounder of Next Street Financial, which provides capital and strategic advice. Angus McQuilken spent most of the last decade helping to recruit life sciences companies to Massachusetts. Now, he’ll be recruiting them in a different capacity: to join McDermott Will & Emeryas clients. McQuilken joined the law firm’s Boston office last week, as manager of business development for its life sciences practice group. He was vice president for communications and marketing for the Massachusetts Life Sciences Centeruntil this past spring. McQuilken was among the life science center’s first employees, joining the quasi-public agency in 2008, before it even had an office. (That came the following year, with the opening of its Waltham location.) Over the years, McQuilken was part of the team that recruited some big names to the state, such as Baxalta (now part of Shire) and GE Healthcare. Now he’ll work to build McDermott Will & Emery’s life sciences client list, a group that already includes giants such as Eli Lillyand Amgen. This will be his first time at a for-profit company after a career in government and nonprofit roles. Can’t keep a secret? Tell us. E-mail Bold Types at boldtypes@globe.com. Correction: An earlier version of this story misstated the year women outnumber men at Babson.